Wildcrafted organically Washington grown Grade A++ Amanita muscaria red cap mushrooms, dry-aged for a minimum of 5 years or more. These are perfectly preserved specimens are the cream of the crop of Amanitas. They are picked personally by members of our staff, and shade-dried under low temperatures (as all our Amanitas are) to keep them as preserved as possible. The colors are deep and rich, there are no burn marks, and these caps are laid out in single layers for the ultimate in preservation of this beautiful and historical mushroom. VERY LIMITED QUANTITIES! It’s often difficult to know if you are truly getting what venders advertise, and this is the very reason we used to offer as wide a range of Amanitas as we do. By showing you everything that’s available, you could see what a vast difference there is between our “B” stock amanita caps and our “A++” mushroom cap specimens. 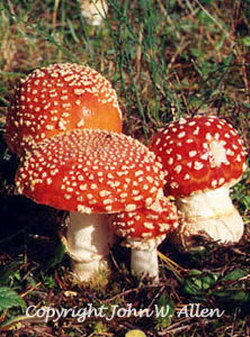 Our A++ Washington State Amanitas are carefully selected specimens that we remove from the A+ stock. These dried caps are sold for their historical and ethnobotanical interest only and are not for human or animal consumption; they are listed as poisons.